Pomatum for the Hair, 1/4 lb Beer Marrow, 1/4 lb pork Lard or fresh butter, 3d. Olive Oil, Mixed with 2d. 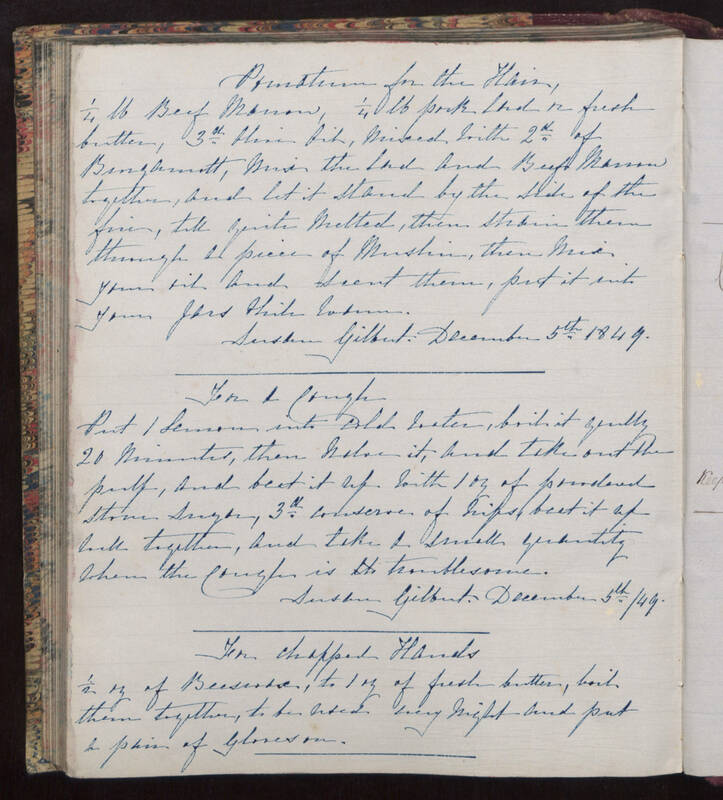 of Bingarnott, mix the lard and Beef Marrow together, and let it stand by the side of the fire, till quite melted, then strain them through a piece of Muslin, then mix your oil and scent them, put it into your jars while warm. Susan Gilbert. December 5th. 1849. For a Cough Put 1 Lemon into cold water, boil it gently 20 minutes, then halve it, and take out the pulp, and beat it up with 1 oz of powdered stone sugar, 3d. conserve of hips, beat it up well together, and take a small quantity when the Cough is troublesome. Susan Gilbert. December 5th. / 49. For chapped Hands 1/2 oz of Beeswax, to 1 oz of fresh butter, boil them together, to be used every night and put a pair of gloves on.